It’s quite the wardrobe staple. If you live in jeans but constantly bemoan the fact that you live in jeans, then it’s an easy way to step things up a notch and look a bit more pulled together. It doesn’t even require heels – although a good pair of stilettos will always add a different dimension to any outfit – managing to look sophisticated with ballet pumps, casual with trainers (clean, elegant ones) and more than a bit edgy with a pair of biker boots. 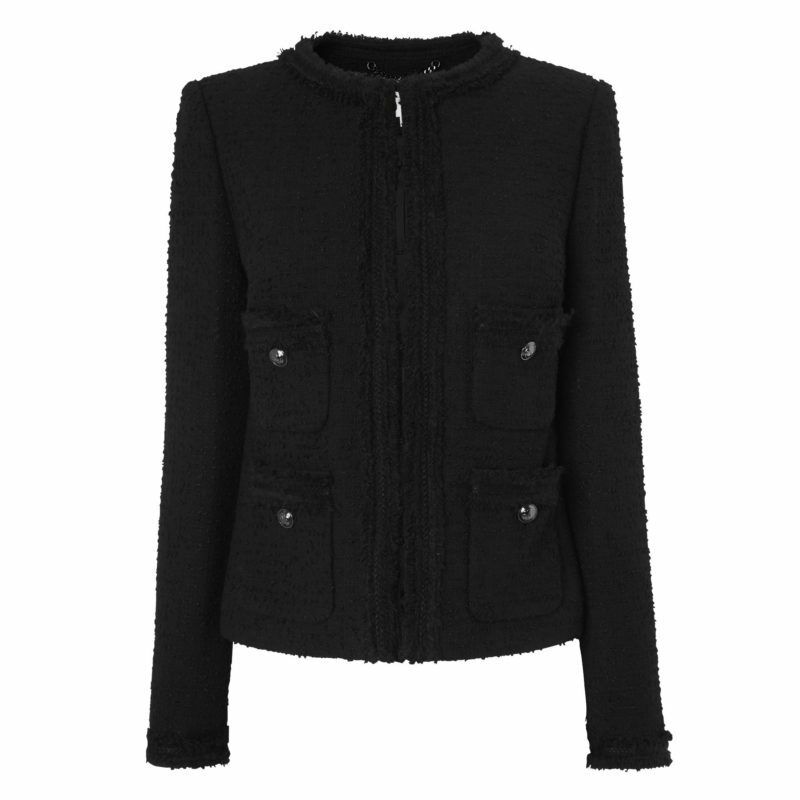 LK Bennett have this luxurious-feeling Charlee jacket in two colours; jet black (here*), which can be thrown on with absolutely no effort or thought whatsoever because it goes with virtually everything and then white with a black trim (here*), which is possibly the more classically Chanely of the two but feels less casual. The white with black trim is definitely not as low maintenance, either, especially if you’re bad at eating spaghetti/soup/yoghurt/kebabs/toast, delete as applicable. You can guarantee that I will ruin a white garment within hours of putting it on. Balsamic vinegar. Ketchup. Paint from a wet railing. Even non-staining things stain me. I’m like a giant stain magnet. I can stain a white top eating a sandwich, or ruin a pale-coloured dress with a packet of crisps. If there’s any dormant stain-producing ingredient in something then I can find it and draw it out. I like to think that I allow stains to reach their full potential – I encourage them, nurture them and give them a safe place to flourish. Anyway, back to the jackets. The white-with-black* looks properly French. I did some Googling and found a good pic of Cameron Diaz doing justice to the white jacket – she has pale blue jeans on with it and some very lovely coral heels. 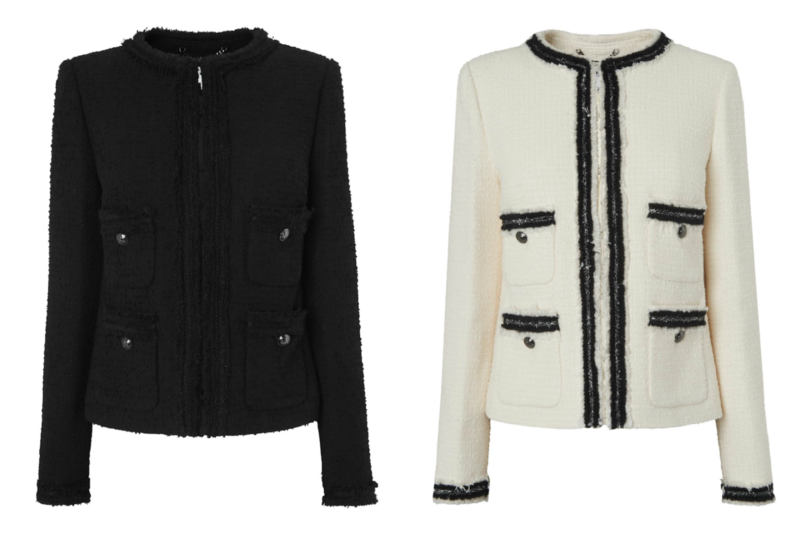 You can find the Charlee jacket at LK Bennett here* – it’s £325, so something of an investment but obviously a mere snip compared to buying a Chanel one. And if you’re after looky-likey ballet pumps then I can tell you that the Cecilia ones from Office* (above) are very luxe-looking with their quilted leather uppers and patent toe cap. I’ve been buying these pumps for years and have them in many colours, though it looks as though they’re currently only making them in black. Obviously if you have the dosh then go for the real double-Cs thing on all counts and flash it about and we will all sit here silently hating you. But I have to say that when I sling my little Chanel (actual Chanel, not Chanely) bag over my Charlee jacket it all looks very convincing. Even though someone shattered my dreams by telling me that my tiny black Chanel bag, which was still hideously expensive, was in fact a wallet. A wallet on a string. It’s even called that, officially. Hold on no: I got that wrong. It’s WOC, a wallet-on-chain. I thought string sounded a bit dodgy! Maybe that could be my knock-off version – WOS. 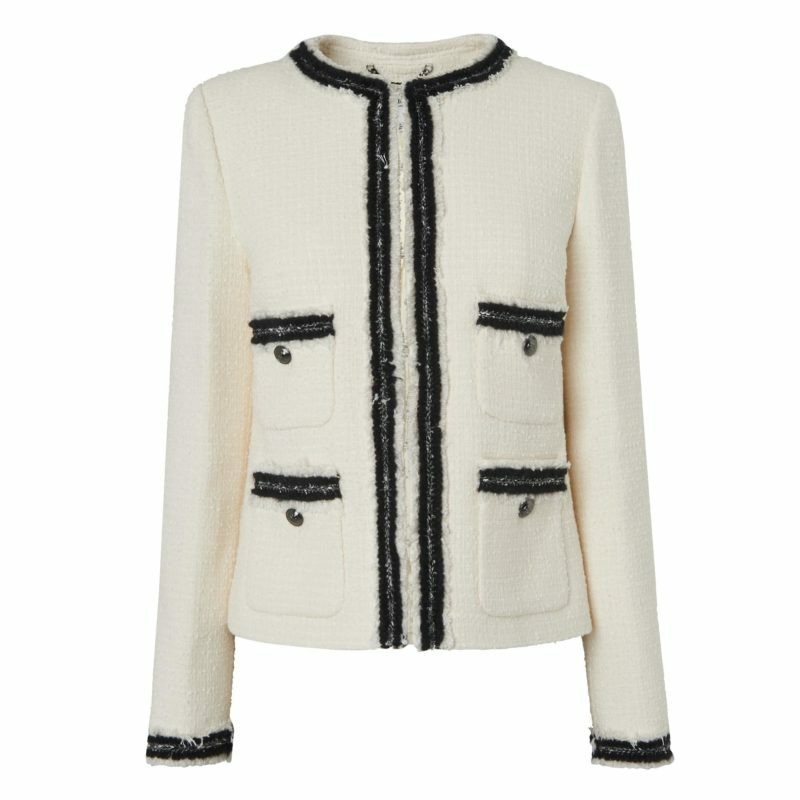 I’ve just found a good little styling piece about the Chanel jacket on a blog called Feather Factor – the post is here. The Chanel bag pictured above is a second-hand one from Vestiaire Collective, the page is here*.